"I have seen a lot of recipes for walleye fish, but they all seemed to be breaded and deep-fried or battered and deep-fried or just baked... 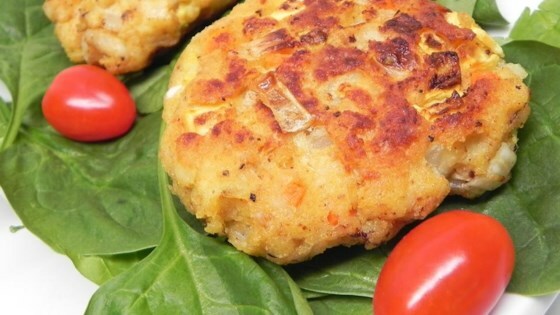 So I figured if you can make fish cakes tasty with salmon and so on... Why not post a recipe up for walleye... Frankly I am just tired of deep frying up walleye once a week. It is time for a tasty change." Combine the cornflake crumbs, bread crumbs, and flour in a shallow dish; set aside. Grind the walleye fillets, or chop finely and place into a mixing bowl. Add the carrots, zucchini, onions, garlic, and eggs. Season with dry mustard, lemon juice, salt, and black pepper. Mix with your hands until evenly combined. Form the walleye mixture into 1/3-cup cakes about 3/4-inch thick, and press into the cornflake mixture. Set the walleye cakes onto a baking sheet in a single layer -- do not stack. Melt the butter in a large skillet over medium heat. Cook the walleye cakes in batches until firmed and golden brown on each side, about 8 minutes per side. we did not care for these, sorry. This was really good and will be making it again. used panko instead. This was a huge hit. Absolutely loved them. It made 12 cakes so yummy! Made this mostly how it says, turned out great! They freeze well once cooked. Can be reheated easily too!